Browsing the shelves at our local game store, Great Hall Games in Austin, I ran into some pleasant surprises when I found several of our fonts on the being used in recent boardgame releases. 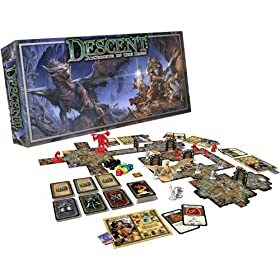 First to catch my eye was the massive box of the fantasy boardgame Descent: Journeys in the Dark from Fantasy Flight Games. It’s another in the great tradition of quest-style games which combine elements of fantasy roleplaying with boards and cards and in this case some pretty fancy miniature figures. The production values are outstanding and part of that is their use of our Valdemar font. Interestingly, even though Valdemar comes with a wide variety of alternate characters, they stuck to the most basic letter forms, though it’s still a good choice for the main and interior titles. Descent has several supplements available, all of which also use Valdemar. Windlass or Buccaneer fonts, passing over what is really our most piractical font, Captain Kidd. Days of Wonder’s game Pirate’s Cove breaks that trend by making excellent use of the Captain Kidd font. The game is relatively simple and suitable for younger players, but still involves some complex strategy. Days of Wonder also publishes Shadows Over Camelot which uses our fonts extensively, particularly Scurlock. Perhaps the most exciting game find was Tales of the Arabian Nights from Z-Man games. The cover design on this game is fantastic, and largely made so by the resources in our Arabian Nights package. Not only does it use our unique Serendib font, which is based on the hand lettering of Rene Bull, it also uses art by Bull from the Arabian Nights package for the cover illustrations. 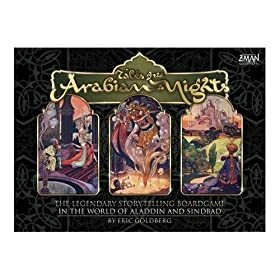 The game is a storytelling game where you play one of the characters from the tales and go on adventures around the medieval world of the Arabaian Nights. 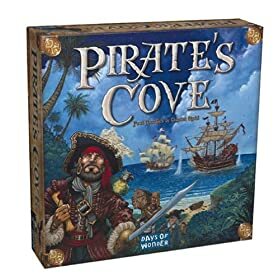 The design of the game is unique and creative and the art gives the game a rich and evocative look and the title looks great too. So head down to your local game store and check out these new games. If the game play lives up to the quality of the graphic design, you can’t go wrong.